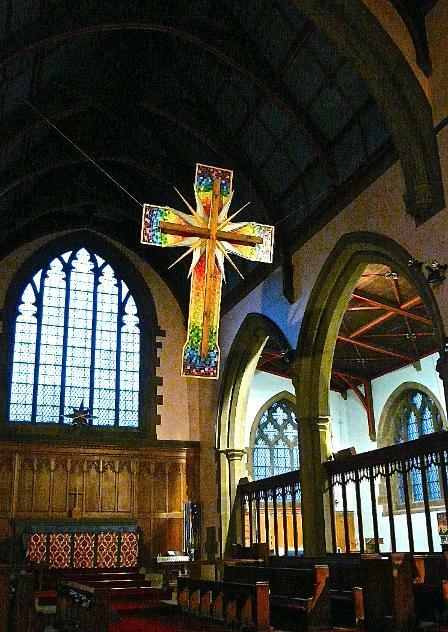 St. Barnabas is a beautiful church situated in the Crosland Moor district of Huddersfield. We are close to the pennine hills of West Yorkshire and we are part of a benefice linked with Christ Church, Linthwaite and our Parish Priest is the Revd.Dr.Paul Witts. At St. Barnabas we believe God our creator is the source of life and we recognise there is more to life than everyday material things. Life is something to do with love, beauty, goodness, faithfulness and hope. Christians long for something of eternal value, something greater and beyond ourselves. We find these values in a man called Jesus who taught us to call God our Father, and to share our lives with God, just as Jesus did. To give expressions to these feelings is what worship is about. You are more than welcome to join us. Our church services cater for all ages and we especially welcome families and lively children who add to our worship and to our humanity. Sunday 7 April 11.00am All Age Communion for the fifth Sunday of Lent. Tuesday 9 April 10.00am Holy Communion. Sunday 14 April 9.15am Parish Communion for Palm Sunday with the Bishop of Huddersfield. Thursday 18 April 7.30pm at Christ Church, Linthwaite, United Benefice Holy Communion for Maundy Thursday. Friday 19 April 2.00pm An Hour At The Foot Of The Cross for Good Friday. Sunday 21 April 11.00am Parish Communion for Easter Day. Tuesday 23 April 10.00am Holy Communion. Sunday 28 April 9.15 am Parish Communion. Tuesday 30 April 10.00am Holy Communion. Sunday 5 May 11.00 am Child led All Age Communion. Tuesday 7 May 10.00 am Holy Communion. Sunday 12 May 9.15 am Parish Communion. Tuesday 14 May 10.00am Holy Communion. Sunday 19 May 11.00 am Parish Communion. Tuesday 21 May 10.00 am Holy Communion. Sunday 26 May 9.15 am Parish Communion. Tuesday 28 May 10.00am Holy Communion. Thursday 30 May 7.30pm Ascension Day Holy Communion. Becky with some of our children exploring the theme of harvest. Children visiting from Oak Church of England Primary School.